Words like vodka and Kalashnikov are know around the world. But how many people realize that they come from the Russian language? Russian actively borrows words from other languages, mainly English. But there are also Russian words that travel in the opposite direction and enter other languages. 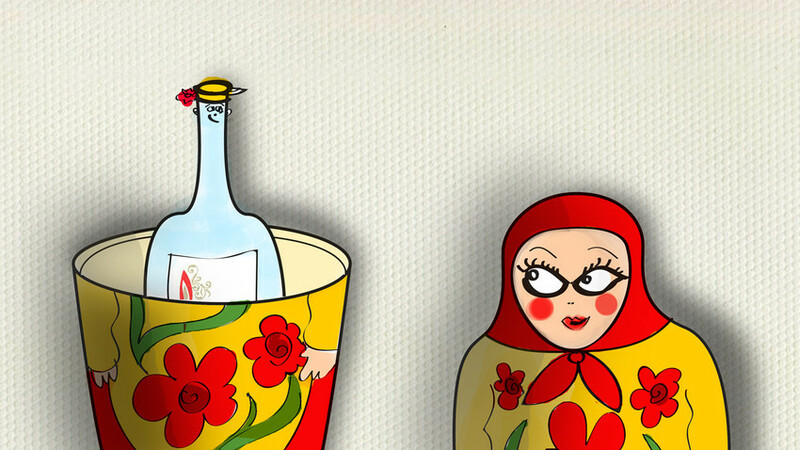 Russia's traditional alcoholic drink first came into being in the 15th century, when Slavs learned how to make the so-called bread wine. The science and technology behind the process were developed in the late19th century with participation of the great Russian scientist Dmitri Mendeleev, who is believed to have come up with its ideal ratio of water and alcohol, at 40 percent. In 1982 the Soviet Union was granted priority in making vodka and the exclusive right to advertise it on the international market under the slogan "Only vodka from Russia is genuine Russian vodka." Vodka bottles now carry a health warning: "Excessive alcohol consumption is detrimental to health." To which popular wisdom replies: "Vodka in small amounts is good for you in any amount." A vehicle driven by three horses was first used in the mid-18th century, when the postal service was in need of light, horse-driven carriages for long trips on usually very poor roads. In fact, there is a popular Russian saying, which says "Russia has two problems: fools and roads." Until the early 20th century, troika was one of the most widely used means of travel and a popular pastime, especially in winter, when sleighs were used. Troika is associated with vast open spaces and freedom; there are many poems and songs devoted to it. Perhaps the most expressive is the image created by Nikolai Gogol in his novel "Dead Souls," in which he compared the whole of Russia to a troika: "Rus, are you not similar in your headlong motion to one of those nimble troikas that none can overtake? … Rus, whither are you speeding to? Answer me. No answer." Matryoshka is a hollow wooden doll, inside which a similar doll of a smaller size is nested, inside which another smaller doll is nested, and so on. Its name is a diminutive of a lower-class girls' name Matryona. Interestingly, the Russian matryoshka was inspired by a Japanese nesting doll that was first brought into Russia in the late 19th century. Usually a matryoshka is a set of from three to 24 dolls. A popular Russian souvenir of recent years is a matryoshka made of Russian political leaders: inside Putin there is Yeltsin, followed by Gorbachev, then Brezhnev, then Khrushchev, then Stalin and finally, a tiny Lenin. A dacha is a house in the country where people who live in the city spend their summer holidays. The name comes from the verb to give (dat’, thus "dacha," means something that has been given). Historically, the authorities in Russia and then the Soviet Union "gave" houses like these to members of the privileged classes, state officials, culturefigures and scientists. Starting from the 1950s to 1960s, dachas became available for ordinary people too, who formed so-called gardeners' partnerships or dacha construction cooperatives. These days, dachas are no longer "given" to anyone — they are either built or bought — but the word has remained. The word pogrom is derived from the verb “gromit'”, meaning "to destroy, demolish," and is used to denote organized violence against a group of people, usually including physical assault, demolition of houses, industrial facilities and religious buildings. The most notorious pogroms were organized against Jews in Russia in the 19th and early 20th century, after which the word became known and used in most European languages. The word is a contraction of the expression “kollektivnoyekhozyaystvo,” meaning a form of collective labor whereby peasants worked together sharing tools and machinery. The first kolkhozes were set up in 1918, and by 1932 all people working the land were forced to join a kolkhoz. For most of them the move had very poor consequences, since kolzhoz as a form of collective economy has proven inefficient in the extreme. These days, the word is used as a derogatory term to describe a poorly managed (despite a large number of managers) organization. The assault rifle that is considered to be the world's best type of firearm and is officially called the AK-47 is known under the name of its designer Mikhail Kalashnikov. He first developed it at the start of World War II, when he was just slightly over 20. The first model of the AK assault rifle was created in 1947. As soon as 1949 it came into service with the Soviet Army and later with armies in many countries of the world. Mikhail Kalashnikov died in December 2013, at the age of 94. Until the middle of the 20th century, the word “sputnik” was widely used in the sense of "a companion", "somebody travelling with another person." However when on October 4, 1957, the Soviet Union launched the first artificial satellite into space, its primary meaning changed to "a space object circling around a planet" and this is what it became known as in many other languages. The launch of the Sputnik marked the start of a space era and, from the political point of view, prompted many to take a fresh look of Russia, which until then had been perceived as a technologically backward country. Perestroika denotes a period of reforms and transformation that began in the Soviet Union, after Mikhail Gorbachev came to power in 1985, and ended with the breakup of the Soviet Union in 1991. Prior to 1985, the word did not have any political connotation and meant "refurbishment, changes done to a building or a structure." Domestically, perestroika meant an expansion of freedoms, more civil activism, and introduction of market economy. In term of foreign policy, it marked a rejection of confrontation and a shift towards cooperation with the West. Perestroika put an end to the Cold War, which had lasted for nearly 50 years, and has therefore entered the vocabularies of many languages as having a very positive connotation. Glasnost is a term signifying a policy of openness and transparency in the work of state structures and freedom of information. It was a key component of perestroika, which consisted in a considerable easing of censorship and a removal of numerous information barriers that existed in Soviet society. The word derived from “glas,” an Old Russian form of the word “golos” (voice). Literally, it meant being able to speak openly and out loud.